You get to the end of an extensive tour, your band have been taking the roof off every night, but now they’re world-weary and road-raddled; they just want to go home and spend time with their families, so what do you do? Well, you book a studio for a couple of days to catch them while they’re still hot and blast through some of your favourite old blues songs. 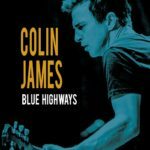 Well, that’s what Canadian bluesman Colin James did, and the result is “Blue Highways”, recorded live in the studio in two days at the end of his last tour. It captures the raw energy of live performance with studio quality without compromising either side of that delicate balance. What about the material? Well, it’s thirteen of Colin’s favourite blues(ish) tunes covering a pretty good chunk of the blues canon, from the opener “Boogie Funk” (more boogie than funk, I think) with harmonica, Hammond, a simple electric riff and the classic guitar/Hammond solo interplay to the solo acoustic closer “Last Fair Deal”. It’s a pretty good demonstration of Colin’s feel for the whole blues spectrum. The Muddy Waters song “Gypsy Woman” evokes, well, Muddy Waters, as does the honky-tonk “Hoodoo Man Blues”, sounding like seventies McKinley Morganfield with his sidekicks James Cotton and Pinetop Perkins. “Lonesome” is a jazzy uptempo shuffle with some lovely guitar fills and “Big Road Blues” is great fun with a slide riff and two lead guitars, but it’s when the band moves away from the standard blues that things get really interesting with the acoustic blues of “Last Fair Deal” and the harmonica-driven “Riding in the Moonlight”; the electric material’s good, but the acoustic songs really stand out. Finally, it’s a brave singer that takes on a song that’s been performed superbly by Otis Redding and William Bell in the past, but Colin’s slow soul take on “Don’t Miss Your Water” is a creditable effort, with a vocal that has hints of the UK’s own Aynsley Lister. It’s not breaking any new ground, but it’s a good demonstration of a band at the top of their game. “Blue Highways” is released on True North Records of Friday November 25.